While my #1 bar food is definitively chicken wings, a close second is burgers. Beefburgers, bison burgers, and today's dish, turkey burgers. This isn't a terribly complicated recipe. Use an icecream scoop to scoop out equal measures of ground turkey. Without touching with your hands, place on a cast iron skillet pre-heated over medium-high heat. Sprinkle fresh ground pepper and salt. Flatten by pushing a handful of onion down into meat. Cook 2 - 3 minutes on one side. Flatted with spatula and flip, cooking another minute. Remove burger patties to a plate, but leave heat on. Place turkey bacon on skillet and cook until crispy on both sides. 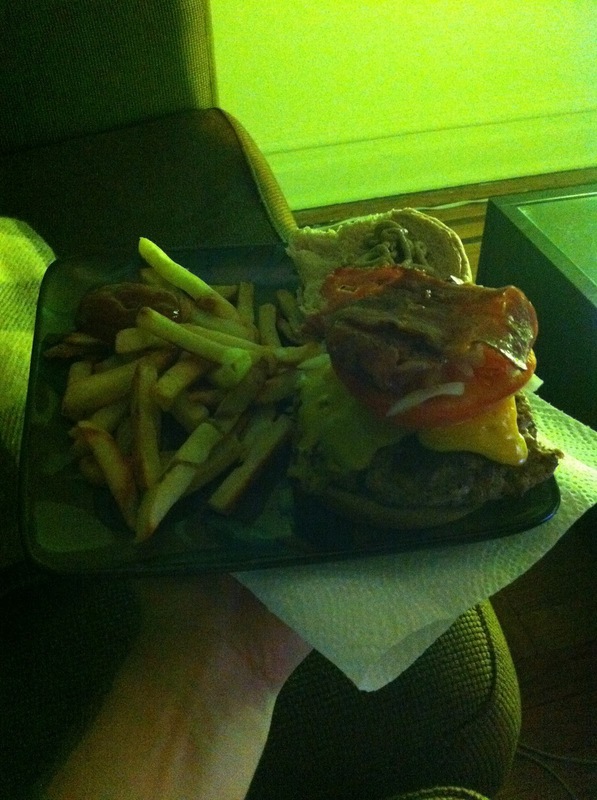 Put burgers back in skillet, top with cheese and bacon, then put in broiler for two minutes. Toast or not toast the buns however you see fit. Personally I like toasty. Garnish and condiment to taste. Cook the fries however you see fit.